For the censuses conducted from 1880 to 1920, you can use microfilmed indexes organized under the American Soundex system. 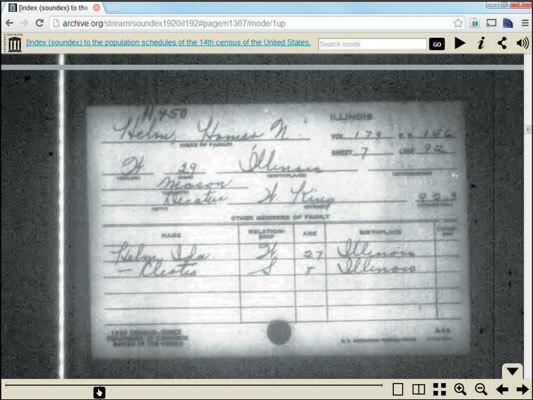 The figure shows an example of a Soundex card prepared for the 1920 census available on the Internet Archive. The American Soundex system is an indexing method that groups names that are pronounced in a similar way but are spelled differently. This indexing procedure allows you to find ancestors who may have changed the spelling of their names over the years. For example, you find names such as Helm, Helme, Holm, and Holme grouped in the American Soundex. The American Soundex code for a name consists of a letter and then three numbers. Double letters count for only one number, and if your surname is short or has a lot of vowels in it, you use zeros on the end to bring the total number to three. To convert your surname to American Soundex, use the first letter of your surname as the first letter of the American Soundex code and then substitute numbers for the next three consonants according to the following list. For example, the American Soundex code for the surname Helm is H450. Write down your surname on a piece of paper. As an example, convert the surname Abell. Keep the first letter of the surname, and then cross out any remaining vowels (A, E, I, O, U) and the letters W, Y, and H.
If your surname begins with a vowel, keep the first vowel. If your surname does not begin with a vowel, cross out all the vowels in the surname. So, in the surname Abell, you keep the letters A, B, L, and L.
If the surname has double letters, cross out the second letter. For example, the surname Abell has a double L, so cross out the second L, which leaves you with the letters A, B, and L.
Convert your letters to the American Soundex code numbers according to the preceding list. Because A is the first letter of the surname, it remains an A. The B converts to the number 1 and the L to the number 4. That leaves you with A14. Cross out the second occurrence of any repeated numbers that are side by side, including a number that repeats the value that the letter at the beginning would have. The remaining numbers of the Abell (A14) surname do not have the same numerical code next to each other. But it could happen with a name such as Schaefer. Ordinarily, the name Schaefer would have the American Soundex code of S216. However, because the S and the C would both have the code of 2 and are side by side, you would eliminate the second 2, resulting in an American Soundex code of S160. If you do not have three numbers remaining, fill in the rest with zeros. Only two numbers remain in the Abell surname after you cross out the vowels and double letters. Because the American Soundex system requires a total of three numbers to complete the code, you fill in the remaining numerical spot with a 0. Thus, your result for Abell is A140.